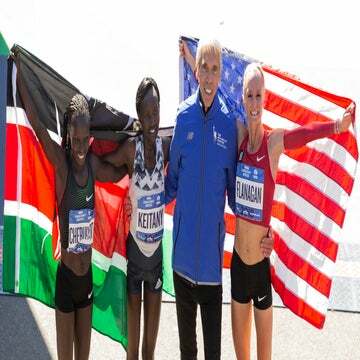 Shalane Flanagan scored a victory for American distance running with her win in the TCS NYC Marathon on November 5, 2017. November 5 was a great day for women’s running. For the first time in 40 years, an American distance runner took first place in the TCS New York City Marathon professional women’s field. What’s more, she won by more than a minute–and was followed by four other top 10 female American finishers. Shalane Flanagan, a 36-year-old Olympic athlete from Boulder, Colo., won the TCS NYC Marathon with an unofficial time of 2:26:53. Mary Keitany, the three-time NYC Marathon champion from Kenya who was aiming for a fourth consecutive win on Sunday, came in second with a time of 2:27:54, followed shortly by Mamitu Daska of Ethiopia, who finished third in 2:28:08. The other American women who placed within the top 10 include Allie Kieffer (fifth place), Kellyn Taylor (eighth), Diane Nukuri (ninth) and Stephanie Bruce (10th). Though no new course record was set (Margaret Okayo’s 2:22:31 record from 2003 remains), this race was a historic one for American women. It’s impressive that there was such a large gap between the two frontrunners at the end of the race, because the elite women stuck together for the longest time before their competitive instincts began burning. Let’s back up to the race start on Staten Island. Weather conditions were ideal, as temperatures nestled comfortably in the mid-50s and the day’s looming rainclouds postponed their release until after the elite women finished running. With weather concerns out of the way, the elites were able to focus on climbing up and over the Verrazano-Narrows Bridge, the most intimidating incline on the course that runners meet during the first mile. The elite pack started the race together, with Italy’s Sara Dossena leading the way for a relatively slow 6:43 first mile. Once the pack descended into Brooklyn, things sped up a bit–but not enough to discourage anyone from the pace. The average mile pace for the next few miles decreased by roughly a minute, with Dossena leading as Keitany and Flanagan flanked her. In the middle of the pack were Taylor and Bruce, Northern Arizona Elite teammates who trained together throughout the summer and were both striving to cinch a top 10 finish. Keitany’s position at this point was surprising; she’s typically one to break off from the pack at her earliest opportunity, so that she can build a gap between herself and her competitors as a race progresses. Not so during this run. Instead, she waited to make a move until after the group passed the halfway mark, making onlookers wonder: would she try to set a new course record? Or would she invest just enough effort to secure her fourth consecutive NYC title? Keitany finally made her first move during mile 14. A spurt of energy briefly delivered her to the front of the pack, but by mile 16, the group was back together again. Meanwhile, Flanagan remained patient, tucked in behind the leaders as she bid her time. The slower pace turned out to be a huge help to Flanagan: instead of burning out quickly, she was able to retain energy and save it for when it really counted. And it really counted at mile 21. Five miles out from the finish, Keitany, Flanagan and Daska broke from the pack, turning the women’s marathon into a three-woman race. They began putting distance between themselves and the rest of the pack: first a small gap, then a large divide that expanded with each step. Keitany was starting to look tired; though the race wasn’t as fast as many anticipated, her energy levels were low. She was able to stick with Flanagan and Daska (which is no small feat–have we mentioned that they were running sub-5:30 miles after their first 20? ), but she couldn’t compete with the energy reserve Flanagan was about to tap into. Healthy: check. Fit: check. Deliver? Oh, yeah. As her feet pounded closer to the finish line in Central Park, Flanagan’s momentum was building, carrying her closer to victory as Keitany’s threat diminished in the distance. Flanagan didn’t bother glancing back; she had plenty of spectators cheering her on, informing her that the gap she’d created was too wide for any competitor to breach. When she finally broke the finish line tape, she did so with a sob and an incredulous smile (and a “F*ck yes!” with which meme creators are already having a field day). After embracing family members gathered at the finish, she accepted a hug and an American flag from New York Road Runners President Peter Ciaccia. The last American woman to win the NYC Marathon was Miki Gorman, who won two years in a row in 1976 and 1977. Only four American women before Flanagan earned NYC Marathon titles; one of them was Kathrine Switzer, who took to the course this year for the first time since she won the race in 1974, leading her 261 Fearless team all the way. 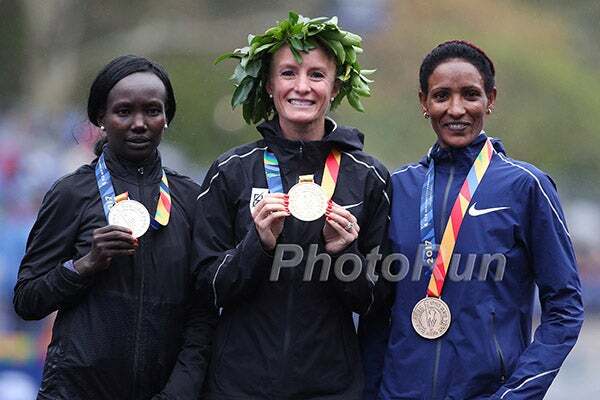 Congratulations, Shalane Flanagan, on becoming the first American woman in 40 years to win a NYC Marathon title. Thank you for delivering a performance to which female runners can aspire, and of which Americans can be proud.